Alliance Jamaica: Future Fambo already been adorned with several "Comeback Artiste of The Year" Awards for 2010, now Future Fambo looks set to continue his renewed popularity with the official release of the Mavado-laced remix to his club banger This Life . 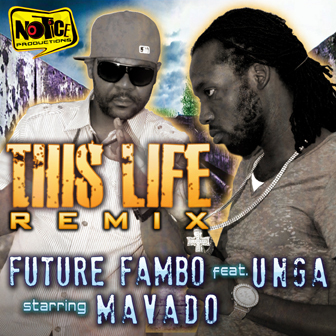 Produced by talented outfit Notice Productions, This Life is the follow-up single to Fambo's smash hit Rum and Red Bull, featuring Beenie Man, that is getting added to Original version of This Life, also featuring Notice Production's Unga, was released in the last quarter of 2010 and instantly became a hit via Kingston's famed nightly club scene. Mavado, longtime friend of Fambo, decided to jump on the track because it was so infectious. "Fambo is talking about everyday things on the track and it struck a note with me," said the Gully Gad. "I love the beat and the hook and my verse (which opens the record) just flowed in the studio." This Life remix already has combined YoutTube views of over 50,000 and already become a staple on Jamaican radio, as well as gaining popularity in the US and UK. It is released on Amazon and iTunes tommorw, Jan 25th. Mavado also has several new releases coming over the next few weeks, including a much-talked about self-produced single called Delilah that has had the internet buzzing without people even hearing the track. Purchase and preview This Life.